The Customer Service Department phone number at American Express Merchant Services is 1-800-528-5200. Are there any PCI compliance fees? With a Mobile Phone Swiper account there are no PCI compliance fees charged to the you “the merchant”. Are there any transaction or monthly volume limits? We don’t have limits like some of our competitors do. When you sign up for a Mobile Phone Swiper account you establish your own limits for monthly sales and transaction amounts. As long as the numbers you provide are reasonable they will typically accepted. For example, if you sell t-shirts and you enter that you sell $5000 per month with a transaction limit of $250 you’ll be fine. However, if you say your transaction limit is $10,000, you’re going to have to explain why you’re selling $10,000 of t-shirts in a single transaction. If you end up exceeding the limits you’ve set, they can be adjusted upwards after you’ve been with us for a few months. Can I use Mobile Phone Swiper in Puerto Rico? No. At this time you cannot accept credit cards with Mobile Phone Swiper in Puerto Rico. Does Mobile Phone Swiper work in Canada? At this time, Mobile Phone Swiper does not work in Canada. How do I change the bank account associated with my account? To change the bank account associated with your Mobile Phone Swiper account, please call customer support and request a bank account change form. Once you receive it, fill it out and fax back to the # located on the form. The change is typically completed within 48 hours. To change your address, please call customer support and request an address change form. Once you receive it, fill it out and fax back to the # located on the form. The change is typically completed within 48 hours. How long does it take to receive funds from my transactions? When you use Mobile Phone Swiper your funds are automatically deposited into your bank account within one to three business days after you run the transaction. For example, if you run a transaction on a Monday, your funds will normally be in your bank account on Wednesday morning. If I want to call in for support who will I be talking to? There are no early termination fees for Mobile Phone Swiper merchant accounts. You can close your account at any time without penalty. Often grouped in with chargeback fees, retrieval fees occur when a merchant’s customer requests a copy of the transaction receipt for a purchase. They don’t necessarily also dispute the charge (when a chargeback would occur) but rather request the receipt from the processor if the merchant for whatever reason can’t provide it. This fee is a throwback to previous technology which did not permit copies of receipts to be stored online…now if a customer requests a receipt, it’s as easy as looking up the transaction in your Mobile Phone Swiper app and resending a copy of the receipt. Retrieval fee charges are extremely rare, and do not occur in tandem with chargeback fees. Where do I go to login to the Mobile Phone Swiper Portal? Can I accept HSA payments through Mobile Phone Swiper? Can I use one Mobile Phone Swiper device for multiple businesses? Yes, you can set up multiple businesses inside the Mobile Phone Swiper app. For more information on how to add multiple businesses, please call customer service at 1-877-387-5629. Can I use this merchant account to process credit cards on my computer? No. The Mobile Phone Swiper system is only available for use on approved iPhone, iPad, Android and Blackberry devices. 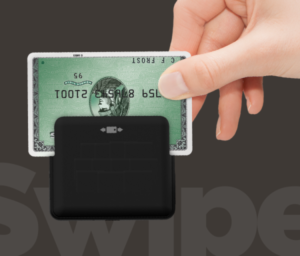 However, USBSwiper.com has excellent low rate programs for merchants who process over $2,000.00/mo in credit card transactions that can be used on all your devices! Does Mobile Phone Swiper have online reporting available? To change your business name, please call customer support and request a business name change form. Once you receive it, fill it out and fax back to the # located on the form. The change is typically completed within 48 hours. Is there a minimum transaction amount I must meet? There is a minimum of 1 credit card transaction per month to maintain the “No Monthly Fee” status. If you process no transactions in a given month, there is a small $3.99 monthly fee assessed. A chargeback occurs when a customer of a merchant calls the bank that issued their credit card to force a return of funds. When this occurs the funds are immediately withdrawn from the merchant’s bank account and an investigation takes place to see if the transaction is legitimate. If the transaction is determined to be legitimate the funds are returned to the merchant. If the transaction cannot be confirmed a chargeback fee is assessed to the merchant. With Mobile Phone Swiper that fee is $15. The good news is that since you are using Mobile Phone Swiper, you capture the customer’s signature and a map showing where the transaction took place. As a result it is highly unlikely you will ever pay a chargeback fee while using Mobile Phone Swiper. Who do I call for help with chargebacks? Please call the Chargeback Department at (800) 367-2638. Can I accept Flex Card payments on Mobile Phone Swiper? In order to be able to accept Flex Card payments you have to be a member of Sigis. You can learn more on their site here: http://www.sig-is.org. One your approved by them, let us know and we’ll get you set up to accept Flex Cards on Mobile Phone Swiper. Can I make some items taxable and others non-taxable? With Mobile Phone Swiper, you can create individual items in Inventory Managment for various services and products. When you create an item, you have the ability to choose whether or not the item is taxable. Can I pre-authorize a transaction on Mobile Phone Swiper? Yes you can. On the home screen in the Mobile Phone Swiper application there is a “Pre-Auth” button. You would select that button and enter in the details of the transaction. Later on, you can go back into the app, find your pre-authorized transaction, and complete it. Note: A pre-authorization is good for five to seven days and results in funds for the amount of the pre-authorization not being available to your customer for that amount of time. Can I process a transaction outside of the United States? No. Currently all credit card transactions must be in the United States. Do I have to swipe the credit card to run a transaction? Do I need an internet connection to use Mobile Phone Swiper? To use Mobile Phone Swiper you’ll need your smartphone or smartdevice (iPhone, iPad, Android or Blackberry) to be connected to WIFI or 3G/4G wireless service. However, the Mobile Phone Swiper app does allow you to store and forward swiped transactions that occur when you have no Internet connectivity. Then once you do have a connection you can submit those transactions. Does Mobile Phone Swiper allow merchants to accept EBT (food stamp) payments? No, Mobile Phone Swiper does not allow EBT or food stamp transactions at this time. How do pre-authorizations work with Mobile Phone Swiper? How long is a “pre-authorization” good for? Once you run a pre-authoriztion, you have five to seven days to complete the transaction using the original authorization. If you wait longer than that to complete the transaction, you’ll have to run a new authorization. If you’re unable to authorize a transaction through normal means, you can always call in a transaction and perform a voice authorization. Just call 800-944-1111 and follow the prompts. Keep in mind you’ll need your merchant account number found in your welcome email. What is Mobile Phone Swiper? Mobile Phone Swiper is a free mobile application and credit card reader that transforms your smartphone, iPad or tablet into a mobile point-of-sale terminal, allowing you to accept credit card payments anywhere you go. What types of cards can be accepted with Mobile Phone Swiper? Credit cards for Visa, MasterCard, Discover, and American Express can be accepted with Mobile Phone Swiper. My Mobile Phone Swiper app is not working on my mobile device. How can I fix it? Make sure you have the latest version of the app from the iTunes app or Google Play stores. Make sure you have the latest version of the operating system for your device. Make sure the volume on your device is all the way up. If the app is still not working the next thing to do is delete the app from your device and re-install it. If the app still isn’t working call our support team at (877) 387-5629 and we’ll help you get the app up and running. Can I order more than one card reader? Yes, you can order as many card readers as you like. The first card reader is free. You can order additional credit card readers from National Bancard for $49.95 plus shipping by calling 1-877-387-5629. Does your equipment have a warranty? Yes, it sure does. If the equipment is defective for any reason other than Merchant’s misuse or negligence, we’ll replace the defective equipment with comparable equipment which may be new or refurbished. We’ll even cover the shipping and handling fees for the replacement equipment. This warranty is good for one year. Is the Mobile Phone Swiper card reader encrypted? 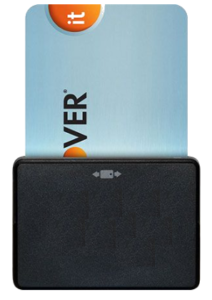 Yes, the Mobile Phone Swiper credit card reader provides “end to end” encryption for your transactions. At no point is credit card data stored on your mobile device or within the Mobile Phone Swiper application. Do you offer expedited shipping for the card reader? Do you have special rates for non-profits? No we don’t offer special rates for non profits. Our standard rates are so good that we’re not able to lower the rates for any further. Do you report merchant revenue to the IRS? Yes, we do. All credit card processors and sales organization are required to report merchants’ gross sales amount from settled transactions (Visa, MasterCard, Discover, PIN debit, etc). The Internal Service Revenue Code Section 6050W which was enacted by the Housing and Economic Recovery Act of 2008 mandates this reporting for the calendar year of 2011, which will require forms to be filed in January 2012 with the IRS. Per the IRS’s definition, gross sales amount means the “total dollar amount of total reportable payment transactions for each participating payee without regard to any adjustments for credits, cash equivalents, discount amounts, fees, refunded amounts or any other amount.” (www.irs.gov) The dollar amount of each transaction is determined on the date of the transaction. Click on any “Get Started” Button on most of our web pages. You will see an application window pop-up and all you need to do is fill out that short form (usually no more than 3-4 minutes) and you will be on your way! Approvals are usually done the same day depending on when you applied. Yep! its that easy! How old do I have to be to get a Mobile Phone Swiper account? You have to be 18 years old to qualify for a merchant account. Otherwise, you need an adult to be the signer on your merchant acccount application. What documentation is required to sign up? For most accounts we do not require any documentation. When you set up your account you’ll be asked a few quailfying questions that will allow us to confirm your identity. As long as you answer these questions correctly you will not need to supply any documentation. We are required by banking industry regulations and federal law to ask for the Social Security Number, date of birth and full name for each of our users. Even if you plan on using our services primarily for a business, we need that information to ensure the Mobile Phone Swiper account holder is either a citizen of the United States, or a permanent resident of the United States. There is no way to create a Mobile Phone Swiper account without providing a valid SSN. In addition to your SSN, we also give you the opportunity to input your Employment Identification Number upon sign up. Having your Mobile Phone Swiper account associated with your business EIN is advantageous when it comes to organizing and completing your taxes, and it helps us identify you as a business. Where can I download the Mobile Phone Swiper app from? Do you have to own a business to use Mobile Phone Swiper? No, you can sign up as a “sole proprietor” and use your personal name or a “doing business as” (DBA) for the business name. If you do sign up as a sole proprietor you will use your social security number for your business tax ID. Does MobilePhoneSwiper.com offer e-Commerce Accounts? Typically, it takes no more than 24 hours to have your Mobile Phone Swiper account approved and set up. Once the account is approved you’ll be sent an email with your Mobile Phone Swiper app login credentials. Once you download the app and login you can begin manually keying in transactions immediately. The card reader is shipped the day the account is approved and arrives one to five days later, depending on where you’re located in the United States. We do offer expedited shipping of the card reader if you need it. Please call customer service to arrange for expedited shipping at 1-877-387-5629. What do I need to use Mobile Phone Swiper? The Mobile Phone Swiper app from the Apple App Store or Android Market. A Mobile Phone Swiper account from our website. Once your account is setup we’ll send you an email with your login credentials for the Mobile Phone Swiper application. When can I start using Mobile Phone Swiper to accept credit cards? Once your Mobile Phone Swiper account is approved, you’ll receive an email with setup instructions and login credentials for the Mobile Phone Swiper app. Once you login and setup your app you’ll be ready to run transactions right away. Typically, this means you’re able to accept credit cards the same day you sign up for an account. Do I have to apply for my merchant account through your website to use Mobile Phone Swiper? Yes, the Mobile Phone Swiper application only works with merchant accounts we setup. Who can use Mobile Phone Swiper? Anyone can use Mobile Phone Swiper to accept credit card transactions. It’s a perfect application for Girl Scout cookie sales, food carts, hair salons and other businesses types large or small. You don’t have to have a registered business, you can even setup the account in your own name if you like. Of course, we also setup accounts for corporations, LLC’s, partnerships and non-profits as well.